Classy Girl Cupcakes was founded in 2009 when owner Erica Elia baked the cupcakes for her own wedding. They were such a hit that friends and family asked her to bake for their weddings and parties. An entrepreneur at heart, Erica realized how much she loved baking and needed a creative outlet to balance her career as a lawyer. She built a website and rented a kitchen, and in her first summer as a Milwaukee cupcake catering company, Erica catered 35 weddings! Business was growing so fast that by the next year Erica was ready for a retail location. 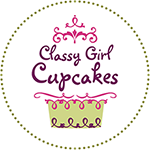 Classy Girl Cupcakes opened its retail bakery on November 23, 2010 in one of the most happening areas in Milwaukee- Jefferson Street across from Cathedral Square Park, home of Bastille Days, Jazz in the Park, and a lively stretch of restaurants and nightlife. Though Erica still holds her law license, she happily devotes 100% of her time to the bakery, and you can often find her greeting customers with a smile or frosting a batch of cupcakes right out of the oven. Since its opening, Classy Girl Cupcakes has grown from one employee to over 25, and caters hundreds of weddings and events a year in addition to serving walk-in retail customers and special orders. On February 1, 2017, we opened our second location in the Brookfield Square Mall food court. Our Brookfield cupcake bakery also bakes cupcakes and cakes on site, fresh from scratch, using the same recipes and techniques as our original Cathedral Square Milwaukee bakery. We’re happy to bring our tasty treats to Waukesha County and the Lake Country area! Both bakery locations offer 25+ flavors every day including cake cupcakes, jumbo filled cupcakes, cheesecake cupcakes, and other unique ways to enjoy a cupcake- cupcake push pops, cupcakewiches, cupcake mousse parfaits, cupcake bombs & truffles, you name it! And we’re more than just cupcakes! We also have talented cake decorators on staff who can design the perfect anniversary cake, birthday cake, baby shower cake, tiered wedding cakes, and more. We only use our homemade buttercream, which means that every cake is a hand decorated work of art. Our decorators have done everything from Mayor Tom Barrett’s 60th birthday cake, to a Milwaukee themed cake for an event for the governor, to a giant “Under the Sea” themed cake for a Milwaukee Business Journal event that took 4 people to lift. One of our decorators even constructed a wedding cake live in front of 300 people at Married in Milwaukee and Newaukee’s “A Marriage Between Artists” event, which you can watch on our Videos page. We also produced our very own full scale festival, Cupcake Fest MKE, held at the Mitchell Park Domes. Our largest single orders to date were 6500 cupcakes for the American Cancer Society breast cancer walk, and 8000 cupcake push pops for PNC Bank’s treat truck promotion! We also offer fundraising opportunities to local non-profit organizations, schools, sports teams, etc. as a way to give back to the community that supports what we do so wholeheartedly. Our mission is to create delicious cupcakes and cakes baked fresh 100% from scratch using the most natural ingredients we can find. We strive for just the right balance of quality, options, and affordable price to create unparalleled value for our wedding and catering clients. Our goal is to inspire positive client relationships for a lifetime of cupcake-worthy celebrations.